The Penn Valley Community MURAL Project! December 2018 - The Penn Valley mural is complete! Local mural artist, Eurhi Jones has artfully rendered the beauty of our area in a modern and creative design. Cyclists move through a scene reflecting native fauna and flora in addition to historic elements in Penn Valley like our County Bridge No. 5 on Old Gulph Road near West Mill Creek Park and our historic Quaker signage. Eurhi also creatively incorporates the topographic map of Mill Creek and stream to reflect the nature of the local watershed. Click here to learn more about native species depicted in the mural. Read the January 16, 2019, Main Line Times article about the project here. See the photos of Eurhi below as she transforms a blank wall into something magical. Assistants included her husband and fellow mural artist, David McShane and Wynnewood resident, Maria Wodraska. The Harriton High School Art Club stopped by for a painting day too! Thank you to all! Community Paint Day! 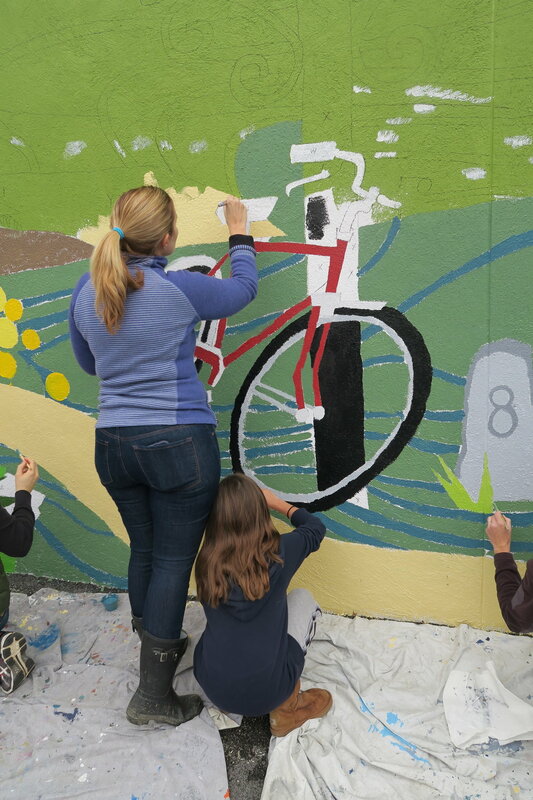 Over 100 residents from across the Township participated in painting the lower portion of the mural. The effort was epic, and we had fun! 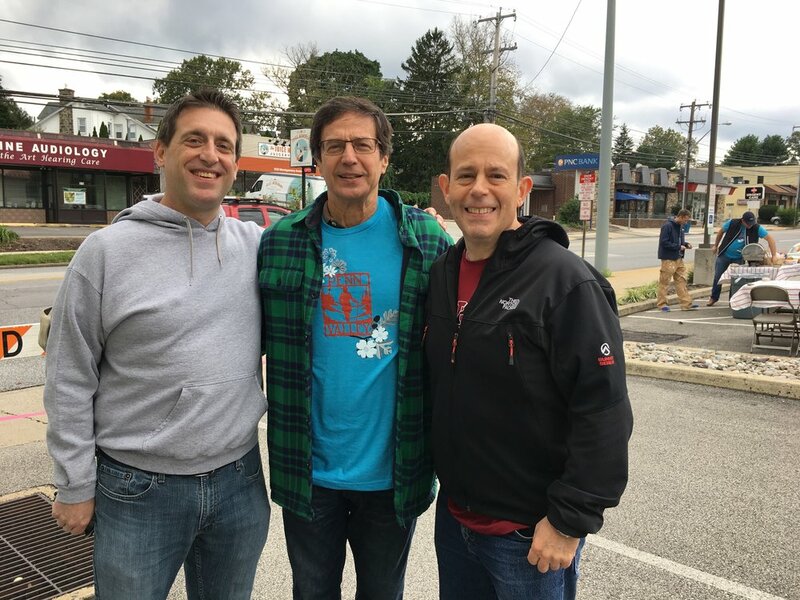 The Penn Valley Civic Association sponsored this community mural with Lower Merion Township through it’s facade improvement program. It graces the west wall of 919-921 Montgomery Avenue, the home of Main Line Cycles and Fast Signs. Thank you to our many generous donors—both residents and businesses—and the owner of Main Line Cycles, Dan Goldberg for his generous partnership in the project. Scroll down for a complete list of donors. Want to attract the species in the mural to your yard and neighborhood? Learn more about native plants here. Native plants feed caterpillars which birds depend on to raise their young. Planting more native trees, shrubs and flowering plants in your space will support the entire array of pollinators and other insects which form the base of the food web upon which all life depends. 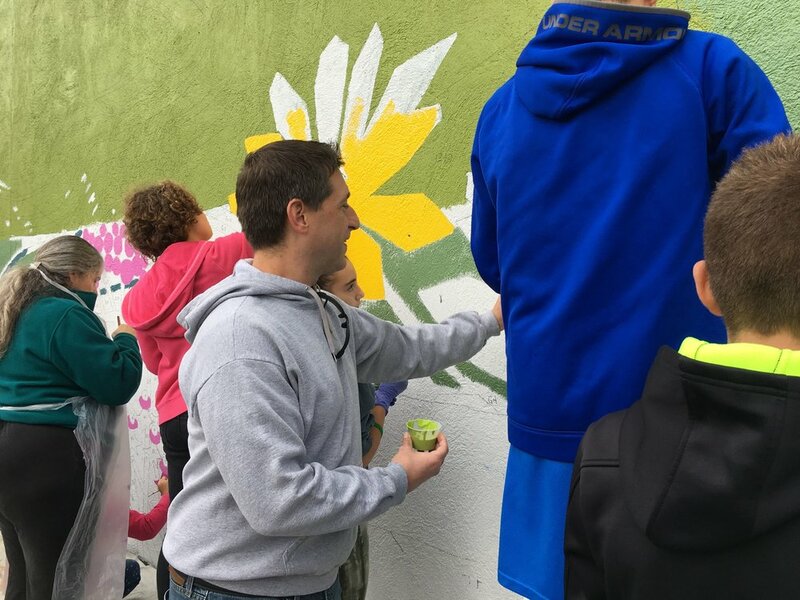 The purpose of the mural is to foster community, educate about environmental issues and native plants/trees, reflect the character of the Mill Creek Valley and Penn Valley and beautify the Penn Valley business district. (Wondering what native plants to incorporate in your space? Click here for a list of high wildlife value plants for your zipcode.) Eurhi has been painting murals for 20 years. Have you seen her work at the Please Touch Museum or the Philadelphia zoo? 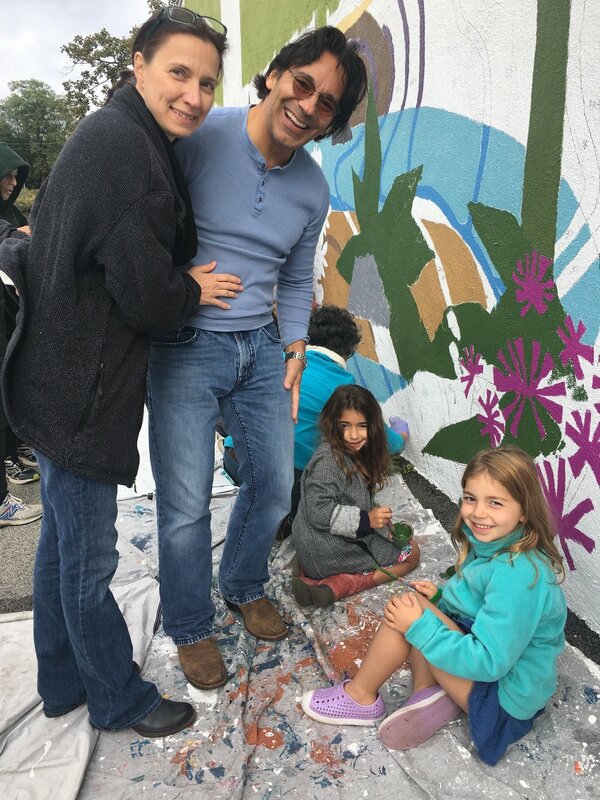 She and her husband David McShane just completed a mural at 1300 Arch Street in collaboration with the Philadelphia Water Department and the Pennsylvania Horticultural Society. Read a recent article about her here. Thank you to our generous MURAL project sponsors! The specially designed t-shirt with the historic Penn Valley neighborhood sign and a mini-graphic of the mural is still available for purchase at one of our community meetings or by emailing pennvalleycivic@gmail.com. T-shirts are $15 each. Mini-graphic designed by local mural artist, Eurhi Jones. This appeared on specially designed t-shirts for purchase to help support the mural project. In addition to our historic neighborhood sign, a spicebush swallowtail butterfly accompanies locally native plants and trees including, phlox, blood root, oak, dogwood and sassafras. The Penn Valley Community Mural titled Hometown Ecology by local artist, Eurhi Jones in December 2018. Can you name the trees, plants, birds and butterflies?